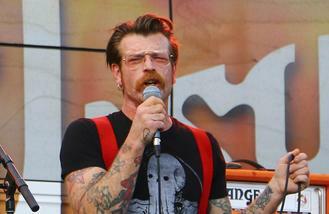 An Eagles of Death Metal fan had their ear bitten off by an audience member at their concert. The 'I Want You So Hard' hitmakers - which includes Jesse Hughes and Josh Homme - were performing at the Opera House in Toronto on Saturday night (07.05.16) when the bloody incident occurred. An anonymous Universal Music employee wrote to local broadcaster Alan Cross recalling the incident and explained how one man literally bit off another's body part and they had to pick it up off the ground just in case it could be mended. The note published on Alan's blog www.ajournalofmusicalthings.com, read: "Some guys just got into a fight in front of us and the one guy but off the other guys ears. "I am not joking. It was the most f***ed up thing I have ever seen. We had to get security to pick up his earn in case they can fix it. "Just sharing because it happened right where we were standing." Athena Ellinas-Towers, the general manager of the Opera House, claims one man was arrested on the scene. She told website Aux.tv: "I didn't witness anything, but there was a confrontation between two individuals." She also said that a gig-goer found the ear and gave it to a venue staff member, who "put it on ice" before medical staff arrived. She added: "This is a first, let's say. I didn't actually believe it when someone came up to me and told me what happened. It's just bizarre." Toronto police have since confirmed the incident and that one man was charged with aggravated assault, while the victim was rushed to hospital, according to Toronto's CBC News. A representative for the heavy metal band are yet to comment on the incident. Akon plans on phoning Adele to set up a collaboration. Taylor Swift was honoured with the inaugural Taylor Swift Award at the BMI Pop Awards on Tuesday night (10.05.16). Taylor Swift took home her namesake award at the BMI Pop Awards on Tuesday night (10May16). Selena Gomez will be introducing herself to randomly selected lucky fans throughout her Revival Tour. FKA twigs and Robert Pattinson have reportedly sent out save the date cards. Tom Jones is set to return to the stage following his wife's death. Liam Payne and Cheryl made their red carpet debut in Paris, France on Monday night (09May16). The Rolling Stones, Bob Dylan and Sir Paul McCartney will perform a second set of gigs as part of mega festival Desert Trip. Naughty Boy, Jarvis Cocker and Kate Tempest are among those on the panel for the Mercury Prize 2016.